May 27, 2016 (LBO) – Sri Lanka’s President Maithripala Sirisena on Friday called on developed nations and multilateral and bi-lateral investors to invest in Sri Lanka as the country lack finances for extensive development efforts. Addressing the G 7 Outreach Summit today in Ise-Shima in Japan, he said that with a revolutionary change of governance, the government has succeeded in creating the path for viable development environment and for reconciliation in a multi-faceted society. He described to the leaders of the world’s most affluent nations the steps taken since the national unity government was established to strengthen democracy, rule of law and good governance. 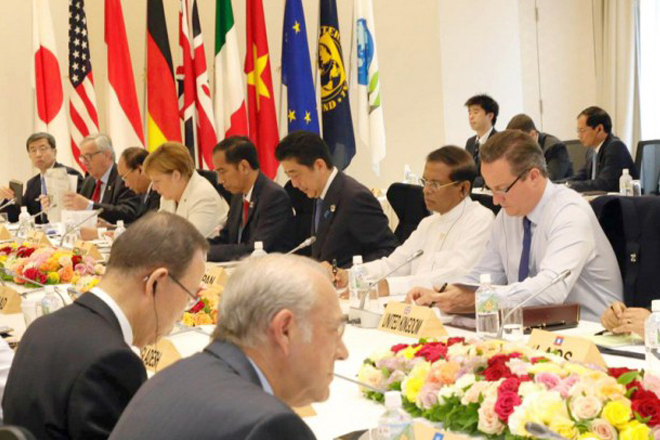 “We lack finances for extensive development efforts and therefore seek developed nations’ and multilateral and bi-lateral investors to invest in Sri Lanka,” President Sirisena said and expressed the hope that the G7 Summit of 2016 will look at countries like Sri Lanka in this regard. “Your invitation to me would yield real benefits beyond bounds, if serious attention is drawn to our problems. I very much appreciate the feelings of friendship and understanding demonstrated by the Heads of State of G7 countries and the Heads of State of Outreach countries during these sessions,” he said in conclusion.